It’s been a great holiday weekend. It may be December on the calendar, but the temps have been in the 40’s here. 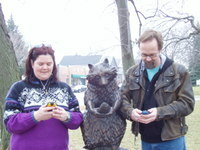 The forecast for Sunday was for thunderstorms- yes, thunderstorms- so we went geocaching on Saturday in Milwaukee. This raccoon statute is holding a trout, but it sure looks like a GPS unit. 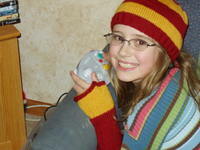 (And me in my 2006 Knitting Olympics sweater.) We had a great time and will end the year with 73 caches found since August; many more in 2007 to come. Since it’s New Year’s Eve, I decided to finish a couple of UFOs. First, KC’s Gryffindor fingerless gloves. We stopped in FDL on Thursday to get the yarn and they took no time whatsoever to whip up. She will prbably sleep in them. She's had them on since getting up this morning. Not even video games could get them off her hands. This afternoon 3rd Daughter’s Pirate mittens got their long awaited thumbs. After three attempts, I was finally pleased with the first thumb and repeated the cause for the second. They were supposed to be hers for Christmas, but since I cut the pressure valve and gave myself a break, she will get them for New Year’s. At least they'll be a remembrance of 2006. Plus, most importantly, 2006 was when this blog started. I now have friends from around the globe who share in my passion for moving wool. I'm looking forward to what 2007 will bring. I hope it's a safe and healthy one for all of us! Bring it on! I got tagged to participate in the "6 Weird Things About Me" meme by AmyLu. As I've mentioned before, I'm not a huge fan of the meme. However, I've had fun reading Lavender's and Isobel's answers (as well as others out there) and decided to play along this time. The sound of breaking glass always intrigues me. You will NEVER confuse that sound with any other. Not that I go around breaking glass but given a dumpster with some old windows and bricks and it'll be a party. I used to have a fascination with sirens. Everytime I heard them when I was a kid, I'd hop on my bike and ride to where they were. Shortly after Doogie and I married, there was a big fire and, as he tells it, I made him trudge through a swamp in order to get closer to where the barn fire was. His shoes were ruined. However, since having children, I've managed to control my urges. In junior high, my best friend and I used to pass notes that we'd written backwards. We'd write cursively, backwards. The notes were best read either held up to the mirror or from the backside held towards a light source. We were quite good and quite quick with our writing and I can still do it today. I have a LONG and odd memory. Events and numbers are what stick indelibly. I still remember locker combinations from school, the phone number of my high school boyfriend's parents house and customer bank account numbers from a bank I haven't worked at in almost 10 years! My husband and I were in the same class the first day of college (Statistics) but didn't meet for another two years (we sat at opposite ends of the room). We've also discovered that we went to the Black Hills and the Crazy Horse monument during the same summer. We like to think that we may have run into each other even back then. It could happen. It did for Jaime and Paul on Mad About You. They met while on a grade school field trip to the museum. Sure, they're fictional, but if you believe it can happen...twenty years later, we're just glad we finally got our acts together! RULES: "Each player of this game starts with the "6 weird things about you." People who get tagged need to write a blog of their own 6 weird things as well as state this rule clearly. In the end, you need to choose 6 people to be tagged and list their names. Don't forget to leave a comment that says "you are tagged" in their comments and tell them to read your blog." See this, it's the extent of the yarn I received for Christmas. Not that I'm complaining, but I believe Harlot may have been on to something when she wrote her recent post about gifts for knitters. I'm sure that there are those out there who believe that I wouldn't want more sock yarn as a gift. (Who are they kidding!?!) To paraphrase Harlot; lovers of sock yarn will never consider there to be too much sock yarn in their stashes. This yarn was a gift from my Mom. She discovered long ago that there is no stopping the growth of sock yarn stash. (Both mine and my aunt's stash.) Though the stash has grown, she has seen the number of completed socks also grow throughout the past year. In addition, she knows that if she wants socks that are in colors that she would appreciate, she should choose/buy the yarn for them. My eyes are quite often drawn to colors that may not be appreciated by my sock recipients. I have a thing for bright colors; blues, reds, purples. Rarely are there "soft" colors or earth tones in my stash. This can make it hard when a quick gift needs to be made for someone who enjoys those colors. But dont take my word for it. Go on...read Harlot's suggestions (pay special attention to #3) and never be afraid to give sock yarn to a sock knitter that you may think has too much yarn. 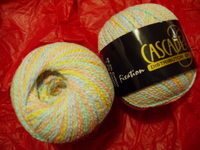 Looking for suggestions for sock patterns that use Cascade Fixation for a pair of short socks for Mom. Isn't it great!?! Now that Christmas has come and gone, those of us who knit and blog can reveal the recipients (and objects) of our recent production. 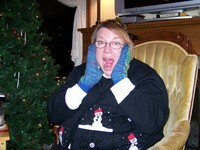 In my case, three pair of Fiesta mittens were gifts for: my MIL, my co-worker, and Fairy Godmother. Doesn't she look great! She was SO surprised and wrote me the nicest email and included this photo. blue mittens when you first started making them!!!!! I love the color combination and the pattern is AWESOME!!! Thank you, Thank you, Thankyou so very much!! I really wanted to call you right now and let you know how much I love the mittens and how honored I am to be the one receiving them but since it's almost midnight and you have children who will be up REALLY early for Santa I thought I had better wait until morning. Thank yous like that are what make all the work worth it! Mittens that I made back in January were for one of my nieces. However, the entire production of 3rd Daughter's Pirate Hat was kept secret because a) she had requested the hat and 2) she had picked the colors. She would have known if I'd included them along the way. Pirate Panda was actually the swatch for 3rd Daughter's hat. But now you all know what matching mittens I've been working on the past couple of days. Thank goodness I cut myself some slack in not attempting to finish them for Christmas. Three pair of socks went to...oops, two of them may not have opened theirs yet...one pair went to our Best Man. And two dishcloths went to my Mom (blue) and Grandma (yellows). Noone within my house received any knitted items this year. However, that's not to say that Doogie didn't get a new hat. HIs was yet another fabulous surprise that I pulled off. 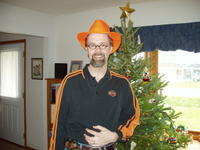 A blaze orange fedora that he can wear while geocaching. Isn't he cute!?! And it matches all of his Harley wear. At least I won't have to worry about hunters mistaking him for wild game in the woods! Merry Christmas Everyone! I hope you managed to pull off your surprises as well. First, this has been a quick knit! The first mitten is finished BUT, it's too small. Thanks to Trek I now know what the problem was. She wrote a comment requesting the name of the pattern (which I'll share on Monday), and when I looked it up, I discovered that the pattern, as written, is for a small/medium sized hand. Unfortunately, I want to make this for a medium/large hand. I could try going up a size needle but am afraid that I'd lose the tight stitch definition. 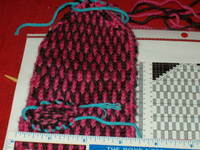 The pattern suggests that if you'd like to knit a different size pattern that you should use a different weight of yarn. Unfortunately, this IS the yarn I want to use. A tweak here and there and voila! I've rewritten the pattern. Sunday is Christmas Eve. How many of you celebrate on the Eve vs. the Day? KC wanted to open presents today (the ones from Fairy Godmother) but just when I was about to suggest Christmas Eve, she reminded me that we need to put out cookies and milk for Santa. The tradition continues for yet another year! There WILL be presents to open on Christmas Eve though; that's when my family joins us for dinner and gift exchange. Then we follow Santa as NORAD tracks him as he travels around the world. If you haven't seen it, you MUST check out NORAD's Santa Tracker. Enjoy! Today was our last day at the office until next Wednesday. Not much was accomplished since it was "feasting day". Everyone brings a dish to pass and we dive in. 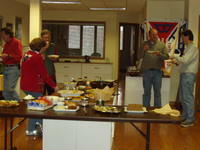 Sure, we did manage to get some work done but mostly we worked on cleaning our plates at the makeshift buffet. The kids were excited to start their break as well. Panda asked to have a sleepover tonight...7 high school girls, 3 pizzas, and some sugar (they made fudge to start the evening off right) adds up to lots of talking and laughing. Lots of laughter! 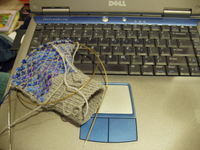 It also meant I got lots of knitting finished on a new mitten. Cast on a few short hours ago and now it's just over halfway finished. It could actually be finished for Christmas if I wanted to "push"...but I don't. Tomorrow: feed the sleepover gals and grocery shop for Christmas Eve. Mmmmmm, more food! Christmas songs: my favorite "religious" one is Oh Holy Night and favorite "contemporary" is Put One Foot in Front of the Other. What's that you say...you don't know that one!?! It's from the Santa Claus is Coming to Town. (Its my favorite holiday special and I haven't seen it this year. I miss the Winter Warlock! Thank goodness for the internet...I can still listen to it/him!) The song is so catchy that I find myself singing it at other times of the year as well. While trying to find links for you all, I found a rock/punk cover of it as well. For real! The oddest Christmas tune I've come across this year is I Want a Hippopotamus for Christmas. The tune is catchy. I find myself whistling it at odd moments. 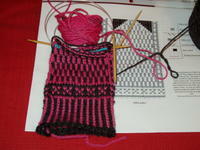 It's getting late, but the mittens I restarted are finished. 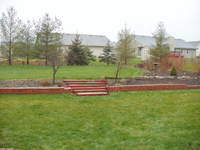 This weekend, once the gifts have all been opened I'll have to update my finished projects photo album. (Don't want any of you recipients discovering my secrets beforehand.) These were the "easiest" set to knit. I think it's because there was no pressure to do so. They are wrapped and ready for delivery. I hope you are all progressing nicely on your projects AND that all of your deliveries have arrived safely. If not...whistle your favorite tune or remember mine...You put one foot in front of the other and soon you'll be walking cross the floor. You put one foot in front of the other and soon you'll be walking out the door. Cheer up Baby!!! You can make it!!! According to the USPS, Monday was the busiest mail day of the year. That makes today the busiest delivery day of the year. (On the news tonight, UPS reported that today they delivered 250 packages per second!) If the view at my front door step is any indication, that seems to hold true! Two big somethings for my family from Fairy Godmother, something for my Doogie, something for my Panda, and something for my boss. My boss knits Christmas stockings with original designs of her own on them. I keep her supplied with knitter's graph paper and she draws her designs from pictures or memory. She's made some awesome stockings and gives them quite often as baby or wedding presents. She has been running low on yarn and doesn't go into stores. I ordered some KnitPicks Palette for her and will include a color card in case there are other colors that she'd like. She has a standard rule with me that I can only give her "consumable" goods. Well, yarn is something I "consume" on a daily basis and maybe I can gently suggest that, though I have no plans to get married again or have anymore children anytime soon, that I'd love to be the recipient of one of her creations. 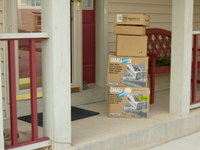 For the record: I placed my order on Monday at 2:30 CST and the order was on my front step today, Wednesday by 2:30. Sure, I'd opted for the 3 day expedited shipping, but it arrived a full day early! In the mail also was an early gift from my brother. Have you seen this yet? 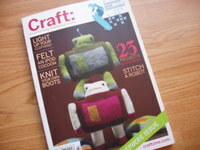 Craft is a new magazine from the people at Make. There are so many cool things on their sites and now they are in paper magazine form as well as online. If you happen to have kids who are still trying to come up with a gift for you, why not send them to the link for a Lego ball winder for your yarn. (step by step instructions) No Legos at your house...I bet you have a few photos...how about having the kiddos make an ornament or two. How are your knitting projects going? Are you finished and still have some yarn and time on your hands; how about a knitted tree and gifts. In any case, I'm quite pleased with the magazine...Thanks Krafter! Note: Next up we'll be tackling favorite Christmas songs. Start thinking of your favorites. We now return to the "Dell" mitten where we left off. Yes, after successfully frogging the mitten back as far as the cuff, and after taking care of the holiday preparations, I could (without guilt or stress) resume knitting. No pressure, no stress, just knitting. It feels SO good to knit because I want to and not because I feel I HAVE to. When I knit, I put a part of me into the knitted piece. I'm so glad these mittens will carry peace with them to the wearer and not stress. For those of your knitting for Christmas; put the music on or a Christmas movie or anything that will lighten your spirit and make yours a "happy" knit. Enjoy the season!